This is a maintenance release. No significant features have been added. Improved assembly dependencies in CodeVeil. Improved CodeVeil heuristics on string reference usage - improves reflection based obfuscation. Fixed registration issues with Sales Tools. Resolves a few deployment issues discovered after the initial release. Obfuscate Everyt hing disguises calls to system classes and third party assemblies. Zero-width obfuscation renames protected methods to unrenderable strings. Code Compression compacts MSIL metadata. Improved runtime protection for non-encrypted assemblies. Better anti-reflection to defeat Reflector and other disassemblers. Virtual Machine Limits control use of software on VMs. Standalone sales tools for sales and support staff. Compile time attributes to declare obfuscation and encryption settings in source. Improved Project and License Editors. Property inlining reduces assembly size and improves performance. Disable 3rd parties from compiling against veiled assemblies. Exception translation supported for all obfuscation methods. Improved user experience when CodeVeil detects tampering. More samples and updated documentation. Better memory usage when veiling assemblies. Compatibility updates for the latest versions of Windows and .NET. Import and export license themes. This release can be used as a complete replacement for version 3.x or 4.x. It is backwards compatible except for a few very specific breaking changes. Existing licenses can be validated with the new runtime license without change. License servers upgraded to the new 5.x runtime can validate and authorize 3.x and 4.x licenses without change. I Have an Assurance Contract, Where's My License? Valid assurance contract holders will receive a private email with instructions on how to obtain their free covered upgrade. Make sure your account is up to date so that the instruction email is delivered to the right address. If you purchased on or after Sep 22, 2011 you will receive a complimentary upgrade. Look for an email from us in the next 2 weeks with instructions on how to obtain your upgrade. To purchase an upgrade, contact sales with your current serial numbers to request a quote. Improved CodeVeil encrypted runtime performance. Network license stability and reliability improvements. Many minor usability and compatibility improvements. This release serves as the final GA release for the 4.x line. We will continue to release security updates and major bug fixes as needed but all further development will be dedicated to the upcoming 5.x release. This release brings full native .NET 4.0 support for both DeployLX Licensing & DeployLX CodeVeil. Full native support for .NET 4.0. One additional sample has been added to demonstrate the use of the new Network Floating License features. We now have official full support for .NET 4.0 available in the nightly builds. This update includes runtime support for DeployLX CodeVeil code encryption features and better support for the updated .NET 4.0 runtime security model for all redistributable components. This release addresses a number of edge cases and potential deadlocks discovered after the initial release of DeployLX 4.0. It also marks a step closer to full .NET 4.0 support. Minor usability updates and fixes to the Network Licensing system. Stability issues in DeployLX application. Fix problems with built in HTML Help using the disqus.com comment system. We've been hard at work brining full .NET 4.0 runtime compatibility. Most of the work has been completed but is still being tested. NOTE: The experimental release will overwrite any previous installs. You will need to completely uninstall the experimental release to restore the GA version. Two additional samples have been posted to demonstrate the use of DeployLX Licensing in a Windows Application and an ASP.NET application. Experimental support for .NET 4.0 is now available. Supports new security settings for the 4.0 runtime. Official support for .NET 4.0 will be announced a few weeks following the official release of .NET 4.0. Currently the Licensing component works without issues against the .NET 4.0 Release Candidate. 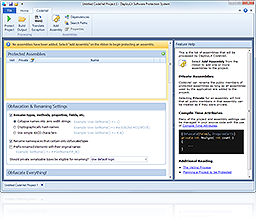 The Code Encryption feature of the CodeVeil Component is not stable in applications running under the .NET 4.0 runtime. Every time Microsoft releases a major system update for the .NET runtime we have to re-vet the entire runtime executive injected by CodeVeil. Each time it takes a few weeks to a couple months to rework with all the unpublished and undocumented changes that Microsoft has made to the core runtime. Our customers of course want 4.0 support so it is an urgent matter for us to get 4.0 compatibility as well.